Samantha Benincasa joins our group as a postdoctoral research scholar. Sam recently earned her Ph.D. in physics at McMaster University, working with James Wadsley on simulations of galaxy formation. Sam works on the inter-stellar medium (ISM) gas in galaxies, with particular emphasis on giant molecular clouds (GMCs) and how they are affected by stellar feedback. We welcome Sam to our group! 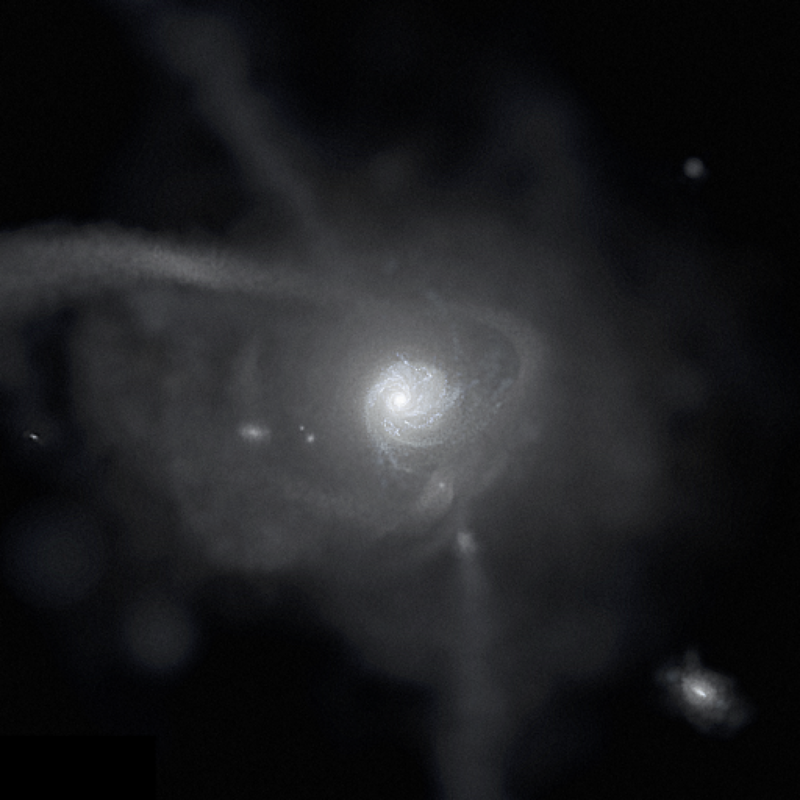 We are excited to announce the release of our synthetic Gaia DR2-like surveys from our Latte suite of FIRE-2 cosmological simulations of Milky Way-mass galaxies. We generated 9 synthetic surveys from 3 different simulations, using 3 solar viewpoints per simulation. Along with these synthetic surveys, we also released full simulation snapshots at z = 0, including all particle data, from the 3 Latte simulations. All data is available at ananke.hub.yt, and the paper that describes our methods is Sanderson et al 2018. Congratulations to Robyn Sanderson for leading this ambitious effort, including developing our new Ananke framework for generating synthetic surveys from baryonic simulations. Thanks to Kacper Kowalik and Matt Turk for tremendous help in hosting this data via the awesome girder.hub.yt. We hope that these cosmological synthetic Gaia DR2-like surveys will provide useful tools to the scientific community in interpreting the amazing data of the Milky Way from the Gaia satellite mission. The Research Corporation and the Heising-Simons Foundation have selected me to be a Scialog Fellow. As part of this early-career investigator fellowship, I will join 50 fellows at the 2018 Scialog conference on Time Domain Astrophysics in Tuscon, Arizona in May. Looks like a great meeting! NASA’s Astrophysics Theory Program (ATP) has awarded me, together with fantastic co-investigators Robyn Sanderson, Sarah Loebman, and Shea Garrison-Kimmel, a grant of $394,000 for Modeling Galactic Archaeology of the Milky Way. Acknowledgements in particular to Robyn Sanderson, who led a significant component of our science case. Our primary goal with this grant is to turn our Latte suite of FIRE-2 cosmological simulations of Milky Way-like galaxies into synthetic star catalogs and mock surveys of the Milky Way, and make these datasets publically available, to provide theoretical predictions and tools for the many surveys of the Milky Way, including the Gaia satellite mission. The James Webb Space Telescope (JWST) announced its first competitive observing allocations for the Cycle 1 Early Release Science (ERS) Program, and the allocation committee has awarded our team, led by Dan Weisz, 27 hours for The Resolved Stellar Populations Early Release Science Program. While much focus of JWST for galaxy science has emphasized high-redshift distant galaxies, JWST also promises significant advancements in observations of resolved stellar populations in nearby low-mass (dwarf) galaxies and star clusters, to understand their star formation histories, stellar initial mass functions, dust extinction, and (combined with HST) proper motions. Congratulations to Dan and the whole team! Sarah Loebman joins our group as a NASA Hubble Fellow and UC Davis Chancellor’s Postdoctoral Fellow. Previously, Sarah was a postdoctoral fellow in the Michigan Society of Fellows at the University of Michigan. I am tremendously excited that Sarah joins us, forming a real ‘group‘! The Aspen Center for Physics has accepted our proposal for a summer workshop in 2018 on the Dynamics of the Milky Way System for the Era of Gaia. Thanks to superb co-organizers Sarah Loebman, Robyn Sanderson, Hans-Walter Rix, Nitya Kallivayalil, and Juna Kollmeier. Our workshop will occur 2018 Aug 26 – Sep 16, and will focus on observational analysis and theoretical modeling of stellar dynamics of the entire Milky Way system, from stars in the disk and bulge to the satellite dwarf galaxies, stellar streams, and stars throughout the halo, as we enter the era of the incredible Gaia satellite mission. We aim to bring together observers, modelers, and simulators, to discuss (1) how to analyze this wealth of high-precision dynamics data and (2) how to develop accurate, cosmologically informed models to interpret them. The overarching goals are galactic archaeology, to understand the full 3D formation history of the entire Milky Way system, and near-field cosmology, to use stellar dynamics to measure the distribution and test the nature of dark matter. Having been on leave (and pretending still to be a postdoc) over the last year, today I fully assume my position as Assistant Professor of Physics at UC Davis. Gulp. Space Telescope Science Institute has awarded me, together with fantastic co-investigators Shea Garrison-Kimmel, Phil Hopkins, Cameron Hummels, Sarah Loebman, and Robyn Sanderson, a Hubble Space Telescope Theory grant of $116,000 for Understanding the physics of gas stripping and star-formation quenching of the satellite dwarf galaxies in the Local Group. Our goal is to use our new Latte suite of FIRE-2 simulations to understand how satellite dwarf galaxies evolve after they fall into a host halo like the Milky Way, with emphasis on how (internal) stellar feedback and (external) environmental processes like ram-pressure stripping remove their gas and quench their star formation, as observed in the satellites of the Milky Way.